Your complete detailed schedule of all acts hitting the stage this year. "We always open with a family oriented thing on Saturday. This year it's a group of women and children who have been participants in one of the Folk Art programs that we do that trains refugee women to work in daycare centers," explains Vanco. "It takes advantage of their traditional songs and dances, which they use with the kids in the daycare…Kelly Armor our Folk Art coordinator, is putting this together, and it will be a program of songs and dances from that project." That project is called Old Songs New Opportunities, and you can hear them open the festival on Saturday. I caught this guy at an art gallery or some such event over the winter not knowing who he was, and I was absolutely floored by what he was doing—which was playing an 8-string guitar, often tap-style, producing airy, ethereal melodic lines which evoke both eastern and western themes in an oft-trancelike collision. Do not miss this performance. Period. Trust me on this one. I realize we barely know each other, so if you need proof, check out some of what it is he does on his website. On their website, I learned that Mahajibee Blues is "not your momma's blues," which is cool because my momma's blues was Crystal Gayle's "Don't it Make Your Brown Eyes Blue." I also learned from their website that Mahajibee is "a slang term used when the word you want to use doesn't come to mind." Kind of like "Smurf," I suppose. Anyhow, as a blues lover, I'm looking forward to these guys, who've been part of the festival circuit for years now. Originally from Arkansas, Holloway's musical lineage runs through Chicago. "He's been around forever. He plays tenor saxophone, and he's played with a who's who of jazz and rhythm & blues," says Vanco. That who's who includes some hefty talents than span the jazz and blues genres – from Yusuf Lateef , Dexter Gordon, and Billie Holliday to Muddy Waters, Willie Dixon, and Bobby "Blue" Bland. And when Vanco says "forever," he means it: Holloway just turned 84 and has been playing the saxophone since before World War II. "He's been on his own for a long time. It's a mix of up-tempo, jump jazz stuff, and outright blues along the line of Jimmy Rushing or Joe Williams, that kind of jump blues." The Campbell Brothers are an Australian company that manufactures soap and…hey, wait a minute…damn Wikipedia. From just down the road near Rochester, N.Y, come the Campbell Brothers. "We presented them here, 2004 maybe, a long time ago. And I've seen them perform several times since then," says Vanco. These guys are billed as "Sacred Steel: African-American gospel music with electric steel guitar and vocal," but before you let any of those labels shape your perceptions, check out their outstanding website where you can get a listen to their sound. Funky and guitar-driven, they fit perfectly into this year's lineup with a jazzy, bluesy, country sound that hearkens back to the age where those three things were the same thing. The Campbell Brothers probably get sick of this comparison, but they bear a lot of resemblance to fellow Sacred Steel practitioners Robert Randolph and the Family Band, which is high praise indeed. "He became a secular musician early on, but these guys are still doing, essentially, their same church repertoire. Although people are going to be hard put to recognize it as church music." Big band. Swing. Basie, Buddy (Rich, not Guy), and Ellington. You know the deal. You know you love it. And, this may be the only band in the festival that you can actually join. Need I say more? Versatile and talented local Eric Brewer is one of the most talented guitarists I've ever seen, anywhere. Don't believe me? There's a famous YouTube video of him performing in the 2008 Guitar Player Magazine Guitar Superstar competition that will make you gape in awe at his talent. As a pretty crappy guitar player myself, it just made me feel…well, mad. Another talented local, Charles Ventrello, teams up with Dave Blaetz, Sheldon Peterson, Katie Chriest, and Brad Amidon to reveal what five decades of Erie Jazz looks, er, sounds like. I wouldn't miss it if I were you. If you search YouTube, there's a very interesting interview with him from 2007. Azerbaijani-born composer, arranger, and performer Amina Figarova is a classically-trained pianist and graduate of the Berklee College of Music in Boston. 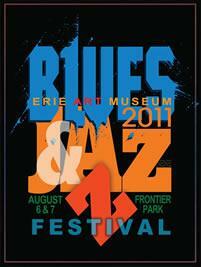 This year she again returns to Erie, bringing her brand of personal, provocative jazz with her. I was unfamiliar with this artist, and after being exposed to some of her work I felt she was what most people traditionally think of when you say the word "jazz." Turns out, I was wrong, and Vanco corrected me. "I wouldn't call her traditional in any respect. Its thoughtful jazz, but she's put her own stamp on it. If I had to categorize it, I'd put it on the adventurous end of jazz today, rather than traditional or loungy type thing." Husband-and-wife team of Holly Hoffman and Mike Wofford close out the festival this year. Hoffman is a Cleveland native who graduated from the Cleveland Institute of Music; Wofford is a Texan who graduated to the LA jazz set at age 18. "They're both just really outstanding players and they've been playing together for quite a while now…they've both been recognized as outstanding instrumentalists. Holly Hoffman has repeatedly been described as the greatest flutist in jazz today, and Mike Wofford also gets really major props as a pianist, so it's going to be an exciting performance," Vanco says.